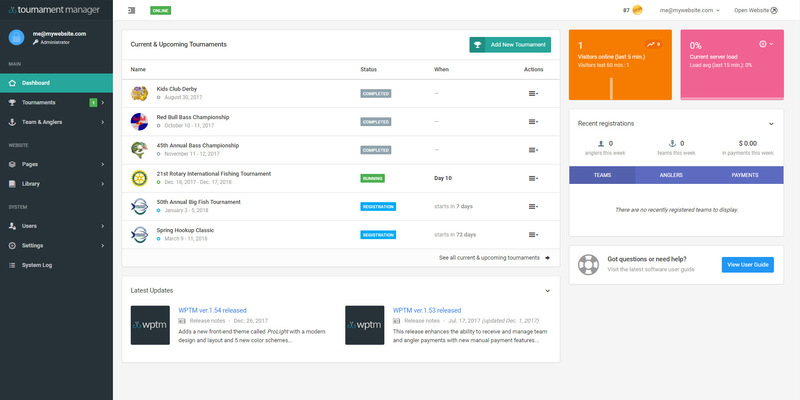 When you login to Web Pro Tournament Manager, you’ll get an overview of your currently active tournaments, as well as recent team and angler registrations and payments. Access to all main areas is available through a simple menu to the left. Choose two levels of divisions for both teams and anglers which can be used across all of your tournaments. 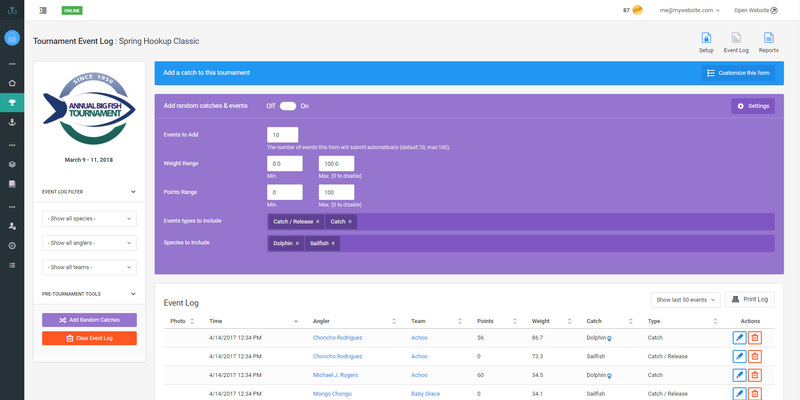 Divisions are used by leaderboards, registration forms, and reports to classify your teams and anglers. Your entire tournament available from one page, including one-click access to registered anglers and teams, species, sponsors, pages, reports, catch entry and log, and tournament settings. 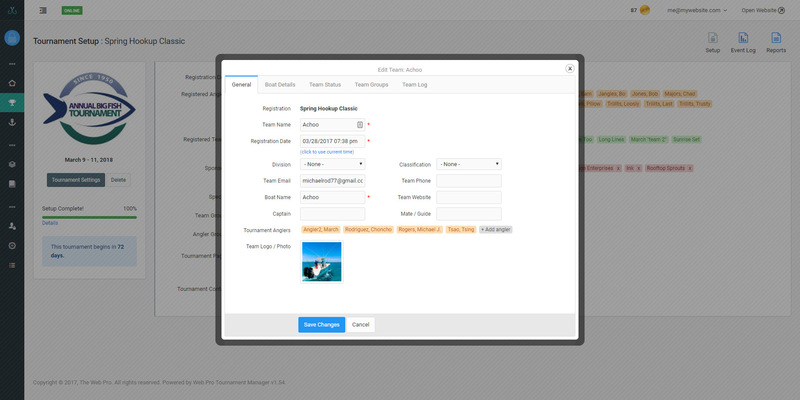 From the Tournament Setup page, you can easily register a new team/boat to your tournament, manage it’s associated anglers and profile, and receive payments. 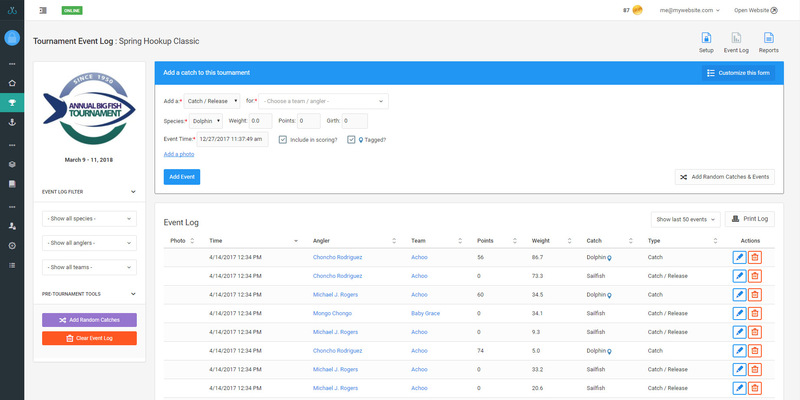 From the Tournament Event Log, add catches and other scored events to your tournament. This section is built for your weigh-in, so it’s simple, straight-forward, and quick-loading. 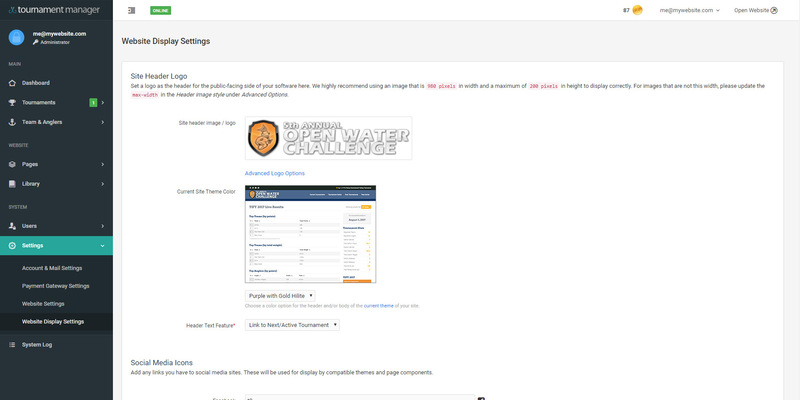 Need to quickly test out your leaderboards? From the Tournament Event Log, use the random catch tool to add test catches to your event log according to the parameters you set. 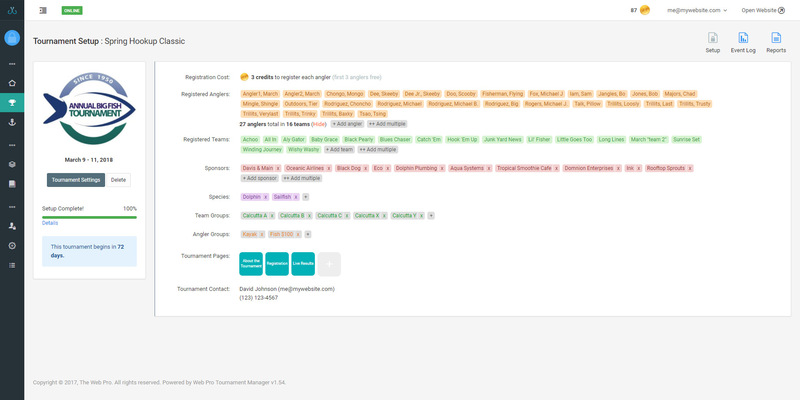 When you’re finished testing, remove all your test data with just a couple of clicks. 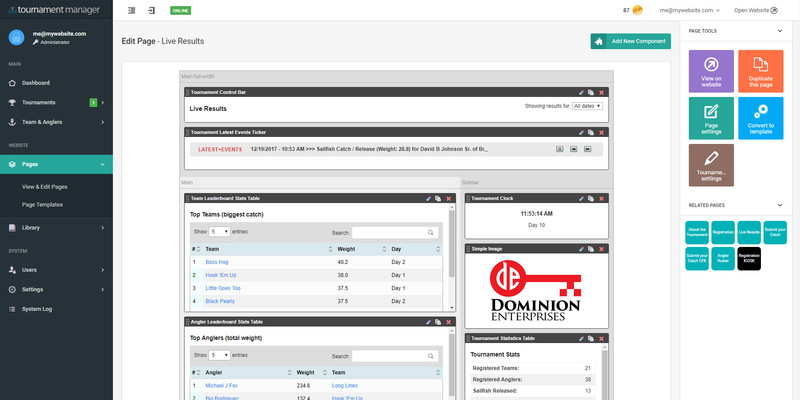 From Tournament Reports, review fully customizable team rostes, angler rosters, and catch logs for your tournament. 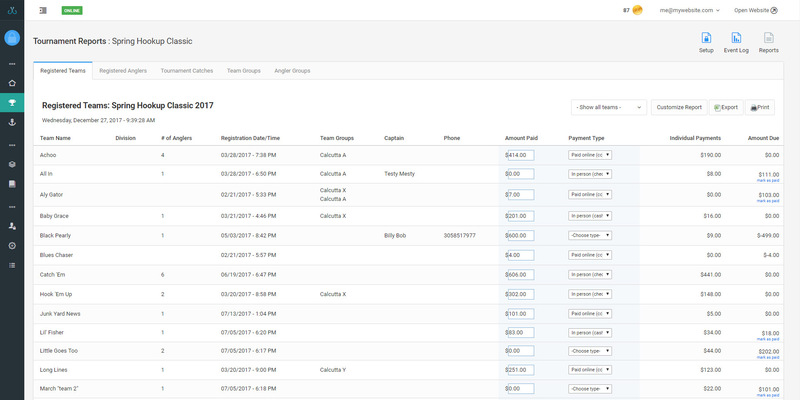 Enable calculations in your reports to track registration or event-related payments for your teams and anglers. 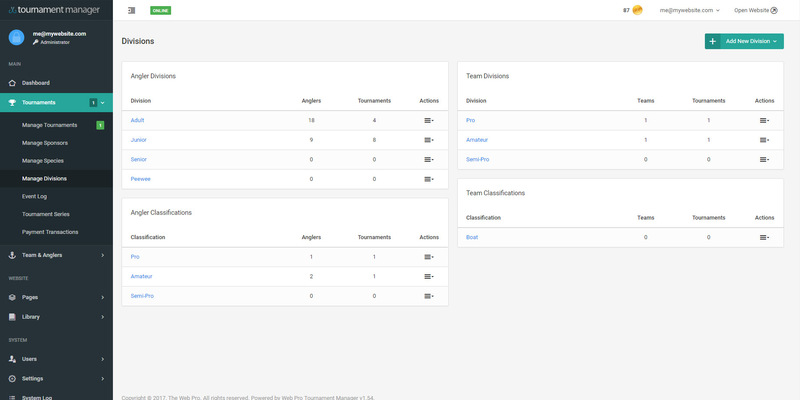 Each report in your tournament has an associated calculation which can be enabled to manage associated financials with that report. Use it to tally simple or complex registration fees, or group- and event-related fees. 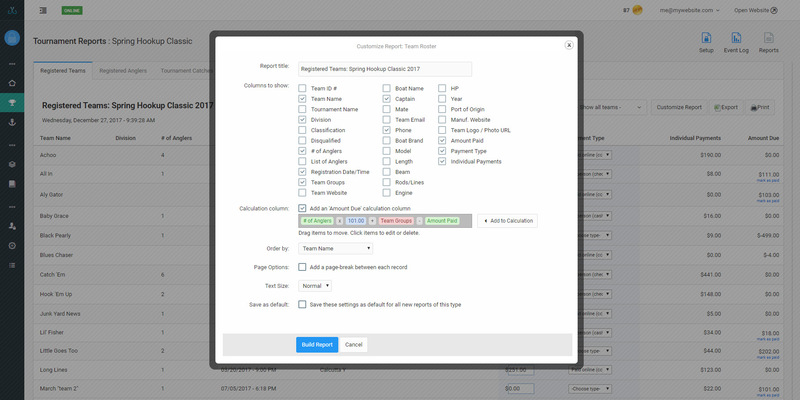 Manage each component of your pages individually to get the setup you need for your live results, registration, and informational pages. Over 40 separate components are available to build your pages from, each with various options to tailor them to your needs. 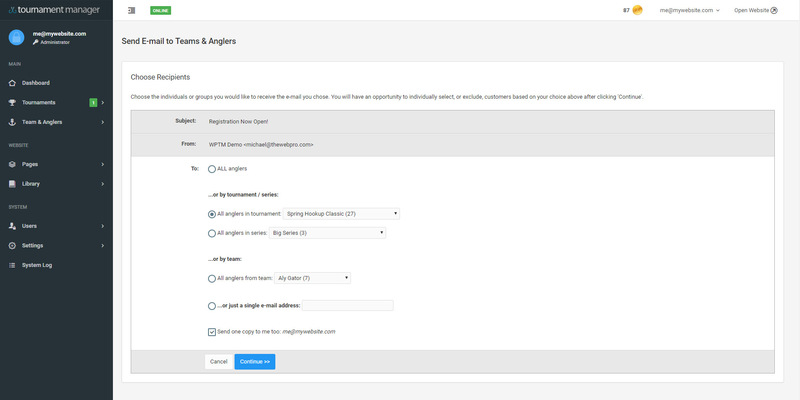 Use the email blast tool to send emails before, during, or after your tournaments to the anglers connected to a tournament, series, or particular team. Select the theme of your publicly-available website, upload your logo, and choose a color scheme that best suits your organization to make the software truly your own.